The port size is 1/8” inch female NPT threaded. The orifice size is 2.5mm and CV value is 0.2. It can withstand pressure up to 115 psi (8 bar) and temperatures as low as 25°F and as high as 212°F. The seal material is EPDM Rubber. This specific plastic valve has a 120 Volt AC coil with a voltage range that is -+ 10. The coil head is fitted with a 10’’ wire lead that can easily be connected with your own choice of terminals. The top of the coil features a label that indicates the valve type and specifications. Its response time is very low; in fact, it acts in less than one second, making it a great choice for all types of applications. This model is mountable in any position and features a conveniently positioned arrow on the body to indication the direction of flow. 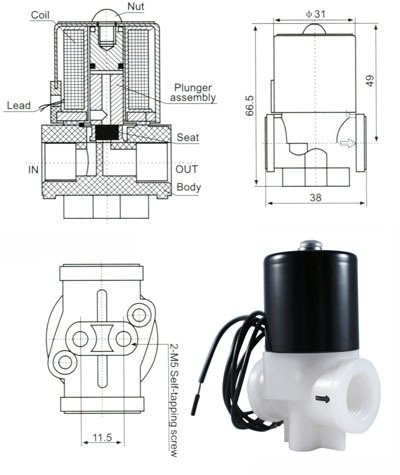 The valve body is threaded at the base and can quickly be mounted with 4 mm machine screws.